If you have a hobby or craft and you're good at it, you may be asking how do I turn this into a money making business? This book will show you, step by step, how to inexpensively market and promote your work profitably. You're creative, you're an artist or a photographer, you have a hobby or craft, something you absolutely love to do, and you are good at it. But you may be asking yourself, How do I market my work? How do I turn this into a real money making business? The answer lies between the covers of this new book. You'll learn the steps you need to take to successfully sell your artwork or crafts even if you have no experience with marketing and even if you hate to sell. As with many other business segments, the Internet and technology have opened up the world and made it your marketplace. You and I, working from the comfort of home, are now on an even playing field with the largest retailers. This groundbreaking and exhaustively researched new book will provide everything you need to know to get your marketing message into the hands of your customers. You'll learn about online galleries, designing your Web site cyber stores, arts and crafts search engines, publicity sources, online forums, auction sites, online marketing, e-mail marketing, and search engine marketing. 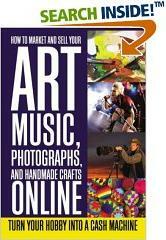 You also will learn of over 300 Web sites on which you can sell your artwork, music, or crafts. This specialized book will demonstrate, step by step, how to inexpensively market and promote your artwork easily and, most important, profitably. You will learn how to quickly find new customers and keep existing ones buying more by using technology and low cost marketing devices that take little or no time on your part. You will learn to develop a marketing plan using hundreds of practical marketing ideas that will help you disseminate your artwork all over the world. Reader Esther Tanuadji of Surabaya, Indonesia says, "Many artists have the idea that while creative pursuits are nice as hobbies, they are no way to make a living. This is indeed true in many cases. However, there is another face of change. The digital revolution has made possible for easy and economical ways to sell anything, including your artworks, online. Using this opportunity, your ability to market your own arts online become something inevitable. Hence, Lee Rowley's How to Market and Sell Your Arts, Music, Photographs, and Handmade Crafts Online could become the tool that all professional artist turn to when they want to make art not only their hobby but also their career. In this book, the author has managed to put together an action-oriented how-to manual that will make any artists better entrepreneurs in organizing their own creative stuffs: displaying their artwork in a virtual gallery and doing the online marketing, as well as managing the selling and shipping. It's a surprisingly compelling, readable volume with specific ideas and practical examples of how an artist can obtain better result in living professionally from their creativity. Of course, it will take hard work and a fair amount of patience to accomplish this, but this book itself is a starting point, a seed that can generate action-oriented thinking - and most professional artist could easily use that kind of tool!"